Our focus has always been to support our graduates in maximising their career success. This can include continued education with postgraduate study, whether that is after a period of work experience or directly from their graduation. Whichever option you choose, we offer discounts on further study to help reduce the cost. Eligible students and alumni receive a discount on their postgraduate tuition fees when they enrol on one of our postgraduate courses. If you're graduating in 2019 register your interest in the LSBU Loyalty Award. 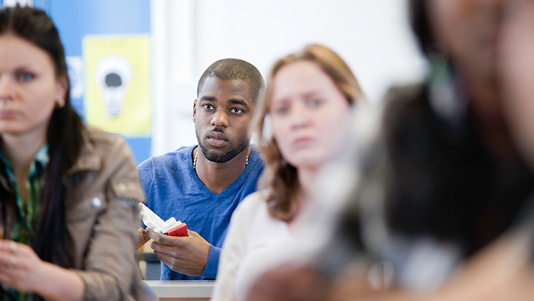 10% discount – all LSBU undergraduate students who completed their programme in and since summer 2015 are eligible for a 10% discount on a postgraduate taught course at LSBU. 10% discount - all LSBU taught postgraduate students who completed their programme in and since summer 2015 are eligible for a 10% discount on an MPhil or PhD. This discount is only applicable for the first enrolment in the initial academic session and not for subsequent re-enrolments. 10% discount – all students who have been part of the inbound LSBU Erasmus and Study Abroad programmes since 2015 and who have been awarded their bachelor’s degree by their home institution since summer 2016 are eligible for a 10% discount on a postgraduate taught course at LSBU. 20% discount - all LSBU undergraduate students who enrol on a postgraduate taught course at LSBU within two academic years of graduation. 20% discount - all LSBU students completing a taught postgraduate degree and progressing onto an MPhil or PhD within two academic years of graduation. This discount is only applicable for the first enrolment in the initial academic session and not for subsequent re-enrolments. 5% early payment discount – in addition to the above discounts an extra 5% discount is applied to the balance of your tuition fees if they are paid in full at your face-to-face enrolment. Students must meet the following criteria. Please note the eligibility exceptions. All LSBU students who completed their undergraduate course with LSBU in either the 17/18 or 18/19 academic year and progress onto postgraduate study in the 19/20 academic year will qualify for the 20% discount on their postgraduate fees. This cannot be combined with the 10% discount. All LSBU students who completed their taught postgraduate course with LSBU in either the 17/18 or 18/19 academic year and progress onto an MRes, MPhil or PhD in the 19/20 academic year will qualify for the 20% discount on their fees. This discount is only applicable for the first enrolment in the initial academic session and not for subsequent re-enrolments. This cannot be combined with the 10% discount. All LSBU students who graduated from their undergraduate course at LSBU more than two academic years ago but since summer 2015 are eligible for a 10% discount on their postgraduate fees. All LSBU students who graduated from their taught postgraduate course at LSBU more than two academic years ago but since summer 2015 and progress onto an MRes, MPhil or PhD in the 19/20 academic year are eligible for a 10% discount on their fees. This discount is only applicable for the first enrolment in the initial academic session and not for subsequent re-enrolments. Students who have been part of the inbound LSBU Erasmus and Study Abroad programmes since 2015, and who have been awarded their bachelor's degree by their home institution since summer 2016, are eligible for a 10% discount on postgraduate fees. Students already receiving an LSBU postgraduate scholarship are not eligible to apply for this scholarship as well. Please note: the discount does not cover any registration fees or residential costs that apply to certain courses. Non-EU students who need a Tier 4 visa to study in the UK will need to submit a formal application. For more information, current students can log on to the MyLSBU student portal. Download the LSBU Loyalty Award terms and conditions (PDF File 174 KB). If you are a Home/EU student email postgraduate@lsbu.ac.uk or call 0800 923 88 88.
International students can email us at international.admissions@lsbu.ac.uk or call 0800 923 88 88.